Posted November 4th, 2003 by Ms. Jen & filed under nature + environment. Late this afternoon, I was pulling up all the dead flowers from the driveway side garden, when I heard and saw a large mixed flock of warblers and bushtits mobbing the backyard elm, next door larch tree, and driveway ficus tree. At first, I thought it was just bushtits, but there were flashes of yellow with higher, louder calls. Migrating Warblers! I ran in to the house to get my camera. I did was not able to capture any of the warblers or bushtits, but I did photograph the resident black phoebe, house finch, and hummingbird that were trying to defend their territory and run the warblers out of the yard. 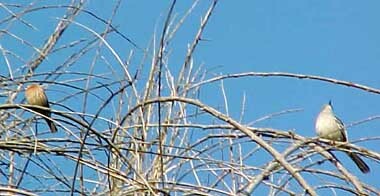 The resident mocking bird and western scrub jay were holding their usual places at the top of the frontyard elm. As the flock of approx. twenty warblers bipped and bopped around the backyard trees, I was able to identify Nashville Warblers (!! 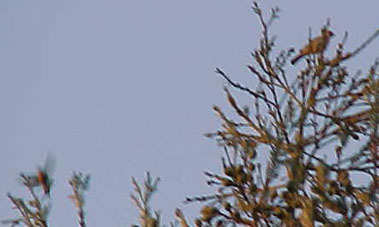 ), Townsend Warblers (!! ), and Yellow Warblers, and possibly a Black and White Warbler (not sure on this one). The warblers were intermingling with the bushtits, and moving so fast that I was not able to get any good pictures. Over all it was a delightful 20 minutes. Although the large fires that ravaged Southern California are now under control, they can be blamed for the polluted air that is spreading over the Western States and into the Pacific Ocean. In additional to ash and smoke, the fires released carbon monoxide into the atmosphere as they burned. 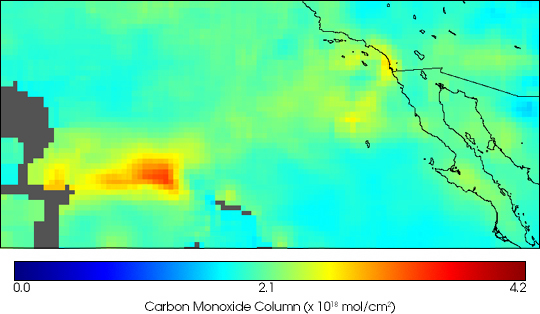 This false-color image shows the atmospheric column of carbon monoxide, with yellow and red indicating high levels of pollution. The data were taken by the Measurements Of Pollution In The Troposphere (MOPITT) instrument aboard NASAs Terra satellite for the period October 26-31, 2003. According to the AP reports on Salon.com and Iwon.com, the California wildfires are on their way to being contained. Firefighters contained the largest and deadliest of Southern California’s vast wildfires Tuesday and made progress against others as the death toll grew to 22. Rain and snow, with chilly temperatures, have aided firefighters in the mountains in recent days. Many firefighters had been sent home, leaving remaining crews to douse hot spots and watch for new ones. San Diego County’s 280,000-plus-acre Cedar Fire was fully surrounded by fire breaks Tuesday. The Old Fire in San Bernardino County, the last of the blazes to threaten communities, was 93 percent contained as it smoldered in forest atop the San Bernardino Mountains east of Los Angeles. Elsewhere, the Paradise Fire was 80 percent contained at 56,700 acres; San Bernardino County’s Grand Prix Fire was 98 percent contained after burning more than 59,000 acres; and the 64,000-acre Piru Fire in Ventura County was 85 percent surrounded. Posted November 3rd, 2003 by Ms. Jen & filed under ideas + opinions. And the Greens have not fielded a candidate as of yet…. Tanya, correct me here if I am wrong.